Would you verify the authenticity of my friend’s Dooney please? I love your website so much. It is really informative and I thank you in advance for all your help. My friend is trying to list a Dooney that she’s thrifted but she wants to make sure its authentic BEFORE selling it. Could you help her check? Thank you so so much and have a great weekend! 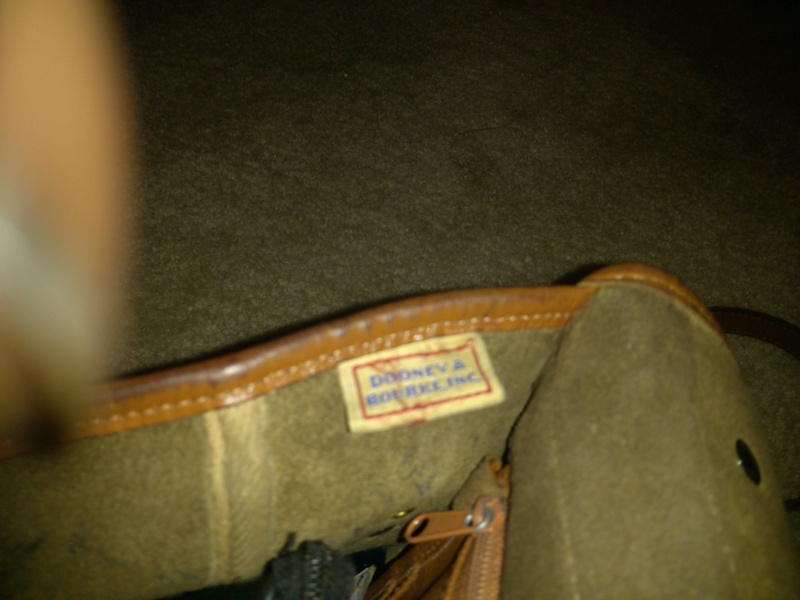 Thank you – this blog is a labor of love of vintage All Weather Leather Dooneys and I am always glad to help with authenticating bags free of charge. It is my way of contributing to the knowledge base out there in hopes it helps prevent fraudulent sales from occurring. Kudos to you and your friend for taking the time to verify before you sell !! 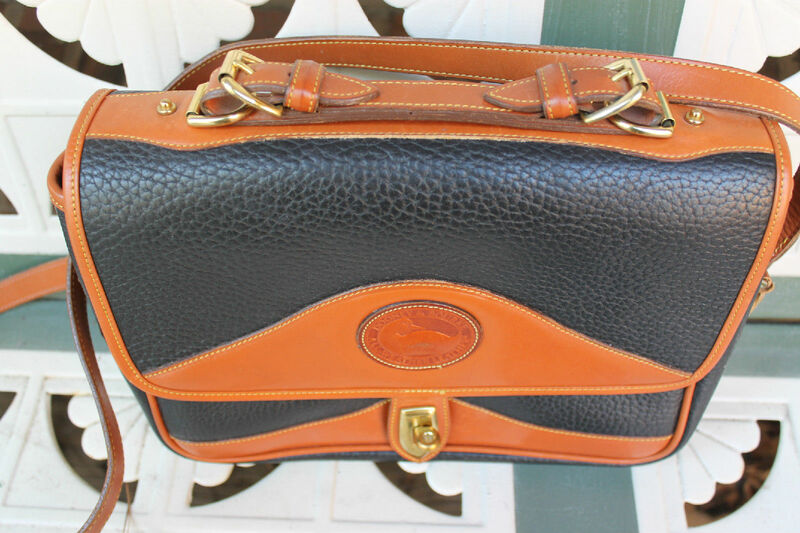 Oh yes, this is a very nice authentic Dooney & Bourke All Weather Leather Vintage Carrier R701. You can read more about this bag in a previous post which explains why it specifically has the word “Vintage” in its name. Click the photo below to go to the Carrier section in our store where you can see the variations in colors and sizes. 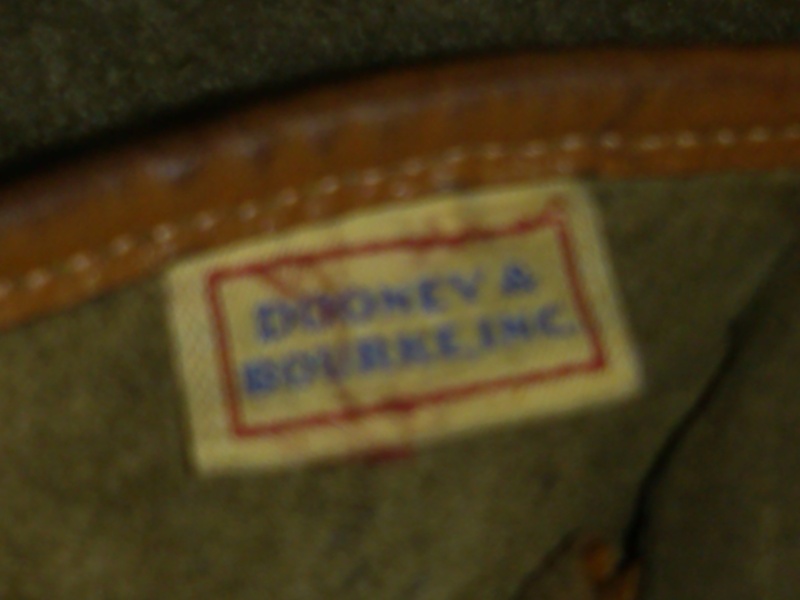 Is this bag from a consignment shop an authentic Dooney & Bourke? I saw your DB blog and I just wanted to ask you a question. 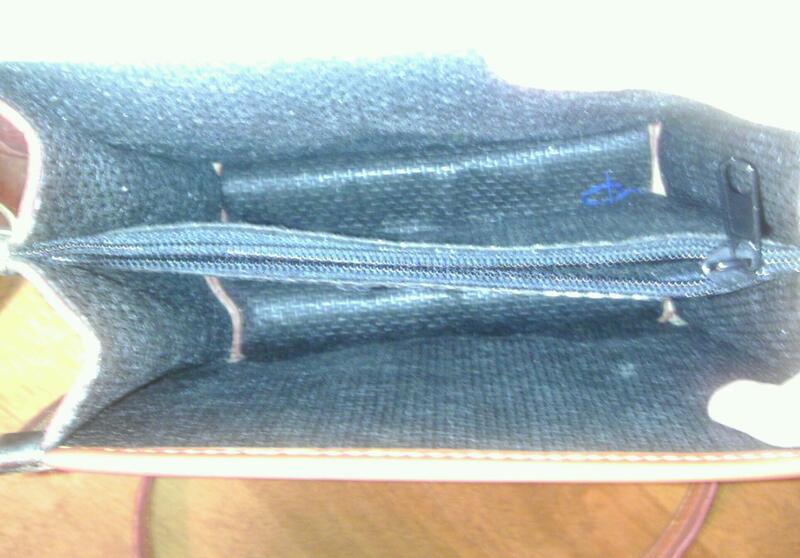 I just purchased a Dooney and Bourke All Weather Leather purse from a consignment shop for 38.00 dollars. I didn’t see a serial number on the interior, or any DB labels on the inside. It does have the DB duck logo on the front with the detached bill, and it has the brass charm with duck on the handle attached with leather. The bag is an All Weather Leather according to the duck label. I have attached a few pictures the shot of the interior is the best I could get, and there are definitely no labels. I just wanted to know if it might be fake if it doesn’t have any DB labels on the interior, or serial number. Sadly, this is a counterfeit bag. 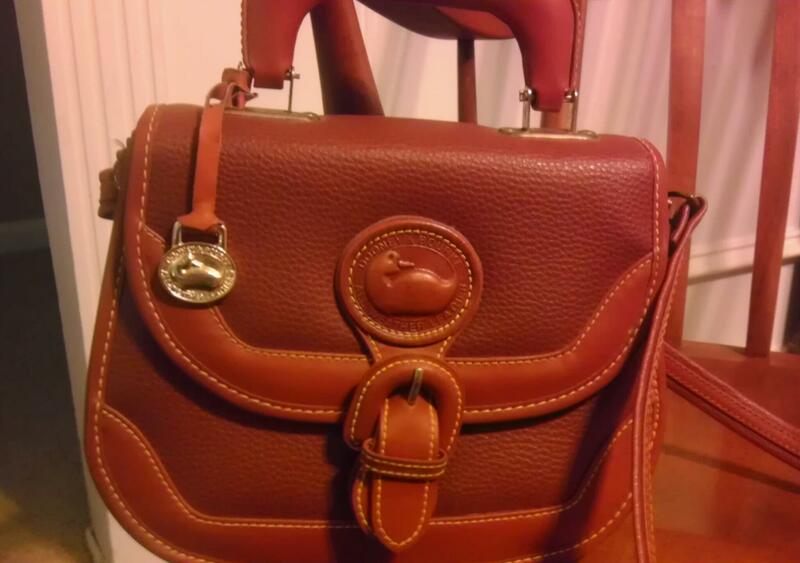 Note the suitcase style handle – they were never used on Dooney handbags. Note the strap attachment – the way the snap is riveted onto the vinyl strap – never done this way by Dooney and no vinyl straps. Dooney straps button on so they can be removed or replaced. Check the authentic one at the bottom of this post. The photo below is of a counterfeit bag. This again screams vinyl trim and this type of buckle was never used on a Dooney bag. 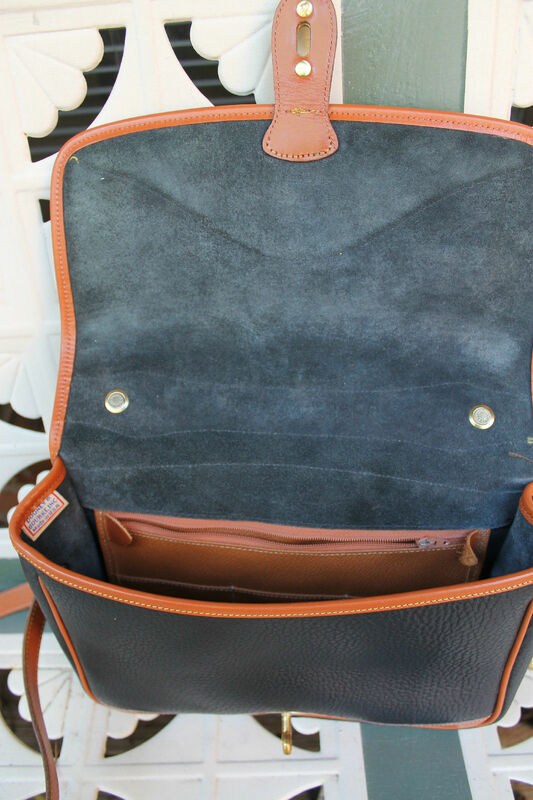 The black fabric interior is a dead giveaway – AWL Dooney interiors are usually the suede side of the leather that the bag is made of or some bags are fully lined with British Tan leather. Counterfeit bag below. Again vinyl trim and the stitching is coarse and bright yellow – not like the fine workmanship of a vintage Dooney & Bourke bag. Counterfeit bag below. I’m not sure what bag they were trying to copy when they made this one………….perhaps a Surrey Carrier? 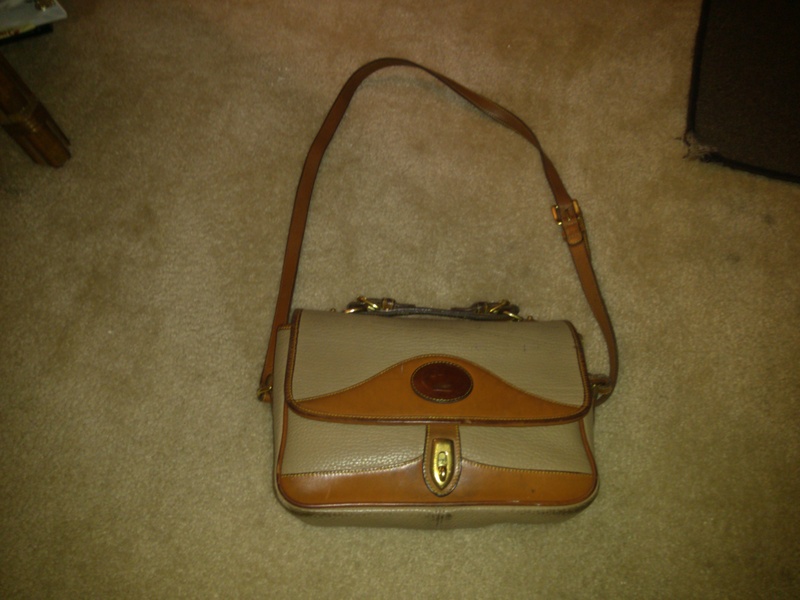 Below is an authentic Dooney & Bourke bag. 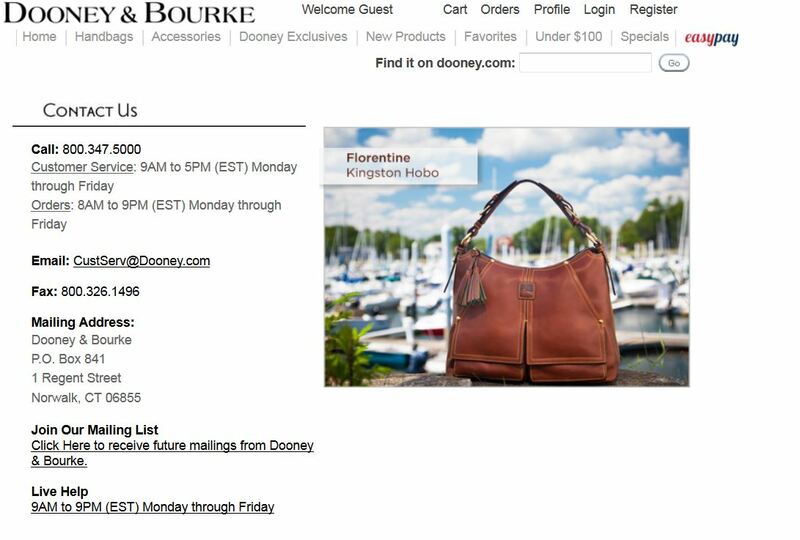 You can click on the photos below and it will take you to a page where you can see the authentic Dooney & Bourke features that I mentioned. Above is an authentic Dooney & Bourke All Weather Leather Medium Surrey Carrier in Rouge and British Tan. 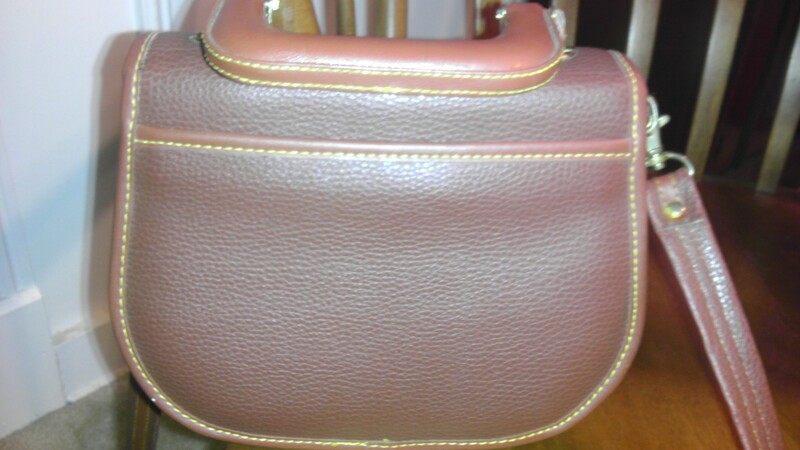 Can the brass latch on my vintage Dooney & Bourke Carrier bag be repaired or replaced? Paula, The brass latch on my Carrier shoulder bag doesn’t click. It spins around and comes unfastened. Can it be repaired or replaced? Thank you. Dooney & Bourke does repairs and refurbishing of bags and also sells parts such as straps and fobs, but it might cost you more for shipping both ways and the repair cost than it would to purchase another vintage bag. Here is their guarantee including information about repair and replacement. When you purchase a Dooney & Bourke handbag or accessory, you are making an investment that will pay dividends for many years to come. Our firm commitment to customer satisfaction is evident in all of our products, which are guaranteed against any defect in craftsmanship for one full year. If your Dooney & Bourke purchase does not withstand the rigors of normal use within one year, we will gladly repair or replace the item free of charge. 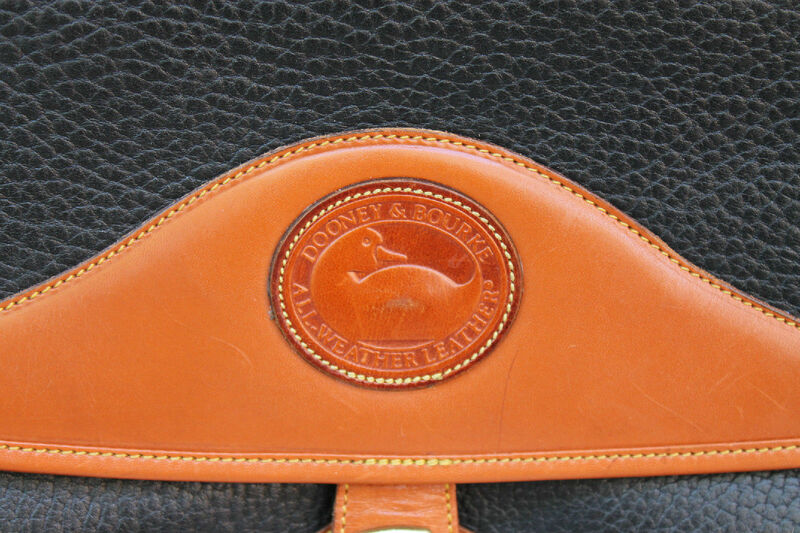 Please keep in mind that some Dooney & Bourke products take on certain characteristics over a period of normal wear that are not considered defects. For instance, the leather trim and handles on many of our handbags will gradually darken to a richer shade with time and exposure to sunlight. This sort of natural aging, along with certain amounts of stretching and softening, creates a distinctive, matured appearance that will continue to enhance over time. In order to be covered by our product guarantee, simply fill out and return the guarantee card that comes with each Dooney & Bourke product. We will gladly exchange or refund your order, provided the merchandise is unused and you respond within thirty days after receiving your order. Shipping and handling fees are not refundable. To return an item, please ship it UPS or insured mail, and be sure to fill out and enclose the bottom portion of your invoice. Any exchanged or refunded item will be credited for the price at which the item was purchased. If you choose to exchange your item, any replacement item will be charged at the current price at the time of your exchange. Repairs: After the initial year covered by our guarantee, we will gladly repair any Dooney & Bourke bag or accessory that has become damaged or worn. Repair costs vary, depending on the condition of the item, but will not exceed half of the current retail price for that particular style. Once we receive an item for repair, we will inspect the item, advise you of repair costs (via mail, allow 1-2 weeks) and request your approval before any repair work takes place. If your bag or accessory is beyond repair or if repair costs exceed half of the current retail price you will be eligible for a replacement. Replacements: If an item is beyond repair, or if the repair costs exceed half of the current retail price, you have the option of having it replaced. You will be offered credit for half the current retail price of that item to apply toward a replacement item of equal or greater value. We will try to accommodate all replacement requests to your full satisfaction, however, it is not our policy to replace an item from a specific collection with another item from one of the following collections/styles: watches, coats, sweaters, scarves, hats, gloves and shoes, Internet specials and the new IT collection. Please note: The original item will not be returned to you. Once you have authorized a replacement, this item will be destroyed. Processing: To repair or replace an item please return it to our factory with your name, address, and phone number (day and evening) via insured mail or UPS. Be sure to include a description of the repair / replacement needed. Allow 1-2 weeks for a written response and 4-6 weeks time for your requested repair and / or replacement. Please let us know what you find out so we can post the estimate and other information here. Is the Vintage Dooney & Bourke “Bone” Color More White or Tan? 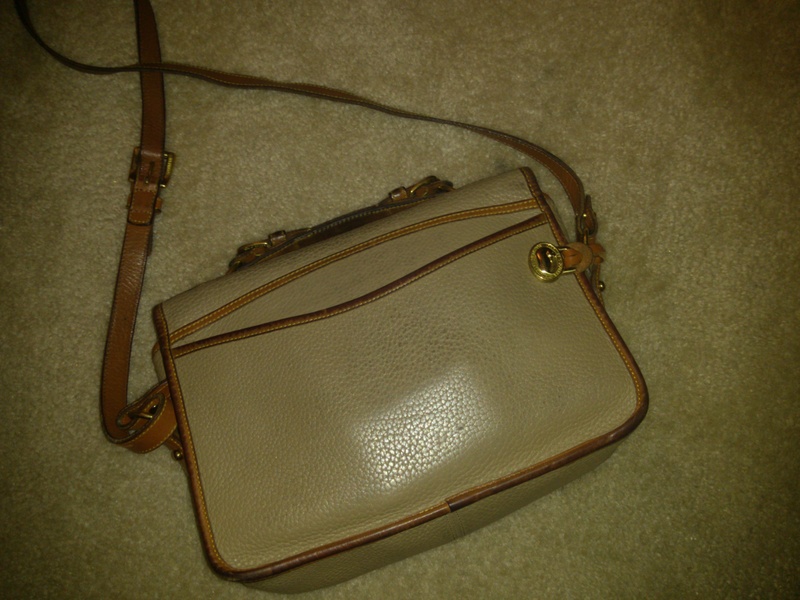 Your Vintage Carrier Shoulder Bag #725 is described as Bone in color but the pictures look darker. Is this a white/bone color or more of a tan color? Dooney’s bone color is an off white light creamy tan just like the photos. Each browser will make colors look different. Dooney also has a white which is quite stark white ! 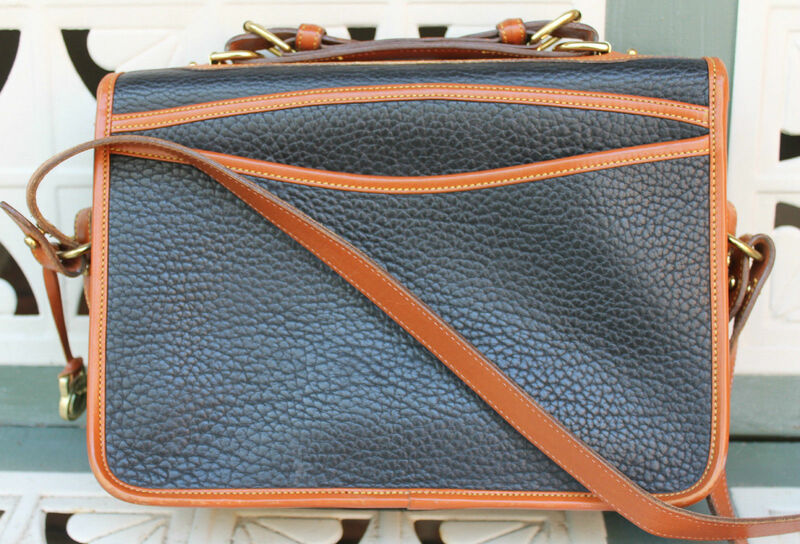 Some people call Dooney & Bourke Carriers mini-briefcases because of the cool handle on top. The versatility of this bag makes it very popular. You can carry it, hang it on your shoulder or wear it cross body. The Carrier number is 701 and when a bag has British Tan trim, the designation is R in front of the number. So this all British Tan Carrier is R701. All weather leather bags are vintage, that is, they were made 20 years ago or more. But this bag is also Vintage for another reason. 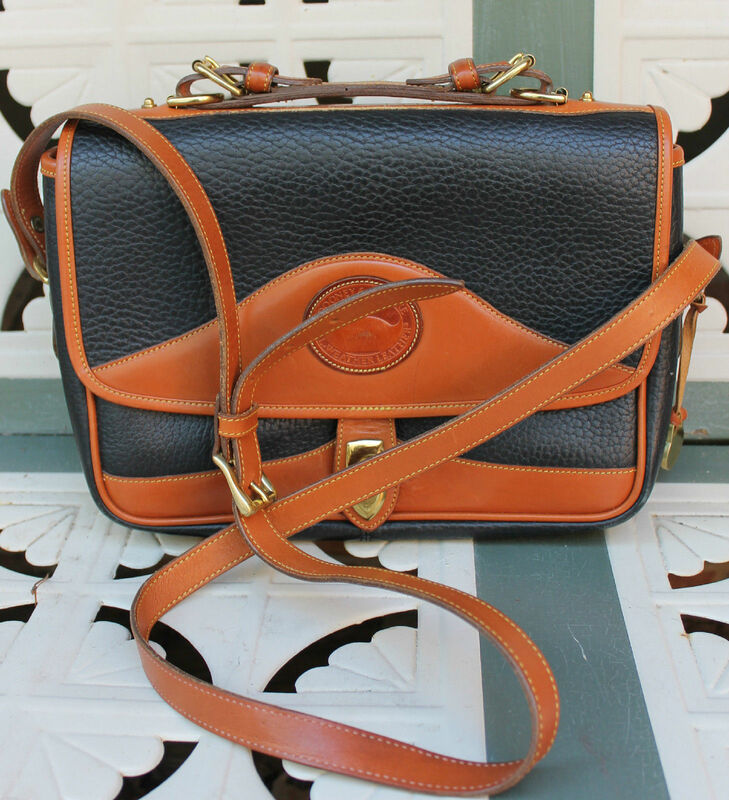 The design element on the front flap designates a design style within Dooney & Bourke called “Vintage”. So this is truly a Vintage Dooney & Bourke with a capital V. You will see the Vintage design element on other handbags as well as on wallets.